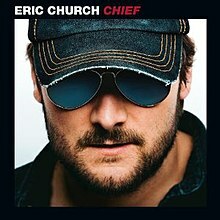 Chief is the third studio album by American country music artist Eric Church. It was released on July 26, 2011, via EMI Nashville. The album produced five singles, including Church's first two number one hits on the US Billboard Hot Country Songs chart—"Drink in My Hand" and "Springsteen", as well as the Top 10 hits "Creepin'" and "Like Jesus Does" and the Top 20 "Homeboy". On June 20, 2012, the album was certified Platinum by the RIAA, for having shipped over 1,000,000 records. As of April 2017, the album has sold 1,957,700 copies in the United States. The album received a nomination for Best Country Album at the 54th Grammy Awards and won Album of the Year at the CMA Awards and ACM Awards. Upon its release, Chief received generally positive reviews from most music critics. At Metacritic, which assigns a normalized rating out of 100 to reviews from mainstream critics, the album received an average score of 77, based on 9 reviews, which indicates "generally favorable reviews". AllMusic reviewer Thom Jurek gave it 5 stars out of 5, saying that it is "defiant, well-conceived, and more carefully executed than it sounds, with some excellent songs". In a review for Slant Magazine, critic Jonathan Keefe stated that "It just doesn’t make a hell of a lot of sense to champion traditional country music while singing over hard-rock arrangements and occasionally Auto-Tuned vocal tracks. That’s not to say he doesn’t do a lot of things, particularly with his songwriting and with some risky production choices, awfully well here. Chief doesn’t make him a country music Jesus, but it does back up a good deal of his braggadocio." Rolling Stone placed the album at number 19 on its Best Albums of 2011 list. The album debuted at number one on the US Billboard 200 and the Top Country Albums chart, selling 145,000 copies in its first week of release. In its second week, the album fell to number two on the Billboard 200 while still remaining at number one on the Top Country Albums chart. On August 31, 2016, the album was certified triple platinum by the Recording Industry Association of America (RIAA) for combined sales and album-equivalent units of over three million units in the United States. As of August 2017, the album has sold 1,957,700 copies in the United States. 2. "Drink in My Hand"
5. "Hungover & Hard Up"
11. "Over When It's Over"
^ "Amazon.com: Chief: Eric Church: Music". Amazon.com. Retrieved June 22, 2011. ^ "RIAA – Recording Industry Association of America". Recording Industry Association of America. Retrieved May 26, 2008. ^ Bjorke, Matt (April 18, 2017). "Top Country Catalog Album Sales Chart: April 18, 2017". Roughstock. Retrieved April 25, 2017. ^ a b "Chief by Eric Church | Reviews and Tracks". Metacritic. Retrieved March 28, 2018. ^ a b Jurek, Thom. "Chief - Eric Church | Songs, Reviews, Credits". AllMusic. Retrieved March 27, 2011. ^ Justus, Karlie (July 20, 2011). "Chief review". Engine 145. Archived from the original on March 30, 2012. Retrieved August 18, 2011. ^ a b Keefe, Jonathan (July 25, 2011). "Eric Church Chief. Album Review". Slant Magazine. Retrieved March 28, 2018. ^ "50 Best Albums of 2011". Retrieved July 28, 2014. ^ "Credits". Allmusic. Retrieved May 15, 2013. ^ "Eric Church Chart History (Canadian Albums)". Billboard. Retrieved October 12, 2018. ^ "Archive Chart". Official Charts Company. Retrieved July 23, 2012. ^ a b "Eric Church Lands First No. 1 Album, Amy Winehouse Climbs Into Top 5". Billboard. Retrieved August 3, 2011. ^ "Top Country Albums: 2011 Year-End Charts". Billboard. Retrieved January 16, 2015. ^ "2013 Year-End Charts – Billboard 200 Albums". Billboard. Retrieved December 13, 2013. ^ "Top Country Albums: 2013 Year-End Charts". Billboard. Retrieved January 16, 2015. ^ "Eric Church Chart History: Canada Country". Billboard. Retrieved October 12, 2018. ^ "Canadian album certifications – Eric Church – Chief". Music Canada. ^ "American album certifications – Eric Church – Chief". Recording Industry Association of America. If necessary, click Advanced, then click Format, then select Album, then click SEARCH.